Right after breakfast I chilled the Nutella and made the dough and instead of letting it go straight from knead to rise, I put the dough in the fridge to slow down the proofing process. I crossed my fingers and we were off to the Children's museum. Where funny enough, they had an exhibit on Korean culture! The food displays looked so real, it made us hungry. The kids climbed, played and screamed till there's heart's content. 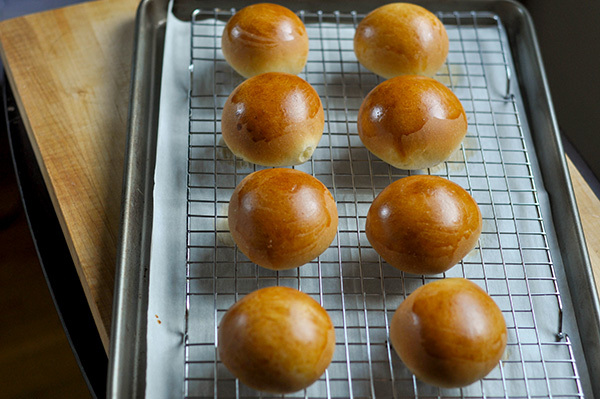 We went out to lunch and I finally made it back home to finish the buns about 6 1/2 hours later. The dough rose slightly. I let it come back to room temperature before I disturbed it. As I pulled the dough out of the bowl, it had the signature strands holding onto the bottom of the bowl, so I knew it was ok. I divided it into 8 pieces and let that rest for 15 minutes then it was onto shaping. Roll or pull the dough into 4-5 inch circles making the edges thinner than the middle. Fill with 1 tbsp of the chilled Nutella and pull the sides up and together, pinching to seal. Turn this over and shape into a proper ball and place on a parchment lined baking sheet. Repeat for the rest of the dough. Allow to rise for another 40 minutes. Once risen, brush with egg wash and bake for 15-20 minutes and cool on a wire rack. I decorated these golden brown orbs with a brush of simple syrup and a sprinkle of...well...sprinkles. And that was about as long as it took for me to and my family to dig into the soft, buttery, chocolatey melty ... you get where I'm going with this. 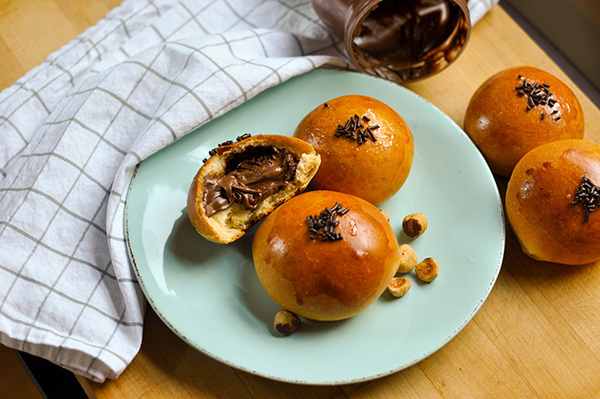 Melty warm Nutella in a buttery soft bun... yea... 'nuff said. Place Nutella in the fridge for an hour to harden a bit. This helps scooping out balls easier later. Meanwhile in a stand mixer fitted with a dough hook, mix the flour, milk powder, sugar and custard powder together. Add the egg and beat till the mixture is crumbly. Slowly pour in the yeast water, you may not need all of it, so pour until a cohesive ball forms. If it becomes too sticky, sprinkle in some more flour. Once a the dough comes together, beat in the butter one tablespoon at a time, then knead for 8 minutes. The dough will be soft and tacky. Allow this to rise for 1 hour. Or you can place in the fridge for up to 8 hours, but allow to come to room temperature before continuing. Once risen, turn the dough out onto a board and divide into 8 pieces. Allow them to rest for 15 minutes. Shape the dough, by rolling out or pulling the dough into a 4 uncle circle. Make sure to keep the enter of the circle thicker than the sides. Place 1 tablespoon of the chilled Nutella in the center of the dough then bring the sides together around it, pinching the dough together. Turn the ball upside down and place on a baking sheet lined with parchment. Repeat with the rest of the dough pieces and allow to rise for 40 minutes. Preheat the oven to 350F. Brush with egg wash and bake for 15-20 minutes or until golden brown. Allow to cool on a wire rack. Make a simple syrup with 2 tsp sugar and 1 tsp warm water. 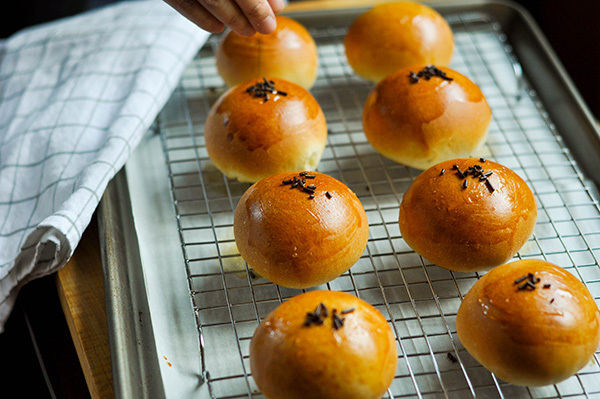 Brush this onto the tops of the buns and top with chocolate sprinkles.